Altitude: Up to 500 metres of altitude above sea level. Habitat: Deciduous or semi-deciduous tropical forests. Description: Ananas bracteatus is a short lived perennial terrestrial plant related to the pineapple that grows up to about 90 cm tall (up to 1,2 m when flowering) and 90-120 cm wide. It is grown as an ornamental plant for its conspicuous red inflorescences and fruit. 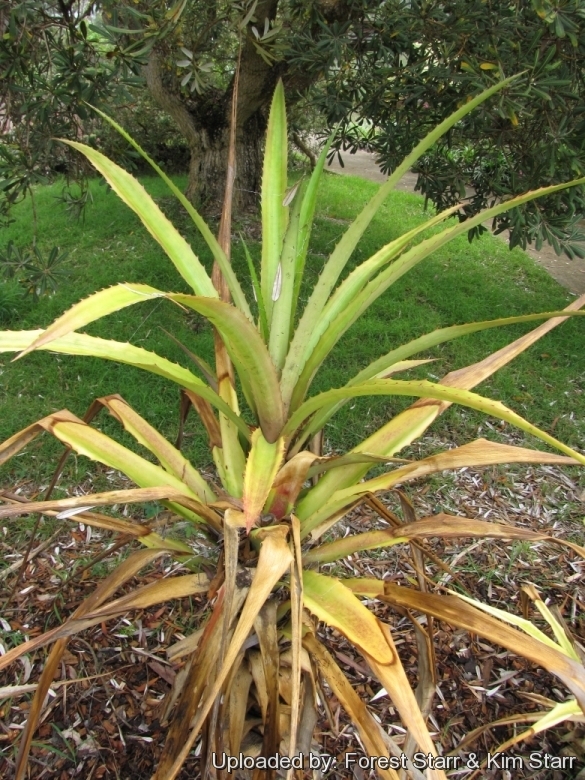 The similar False Pineapple (Pseudananas sagenarius) has spines at the base of the leaves that curve downward toward the base of the plant. Pineapple (Ananas comosus) has much less colourful inflorescences and larger fruit. Some taxonomists classify this as simply a variety of pineapple (Ananas comosus), not as a separate species. All the species in Ananas were recently transferred as varieties or cultivars of Ananas comosus. This plant is now Ananas comosus var. bracteatus. Leaves: Many, evergreen, arching, arranged in a spiral in a spreading rosette, simple, ribbon-like, long-attenuate, acuminate, pungent, up to 1,5 (or more) cm long and not over 40 mm wide above the dilated base, coriaceous, fibrous, solid dark green with a red hue with subdensely serrate margins with sharp spines that curve up toward the leaf tips. Inflorescence: The floral scape is up to about 50 cm long, robust and straight, develops at the centre of the rosette and ends with an inflorescence formed by showy, spiny, imbricate bracts, with serrate, pink or bright red margins, which surround the small violet-purple or reddish pink flowers and with, on the top, a thick coma (tuft of leaves). This plant is monocarpic (it bears flowers only one time in its life). Usually the plant will bear one flower stalk at a time though there may be 2 or 3 heads. Blooming season: Late Spring/Early Summer. The flower/fruit structure will remain on the plant throughout the summer, gradually fading in colour and eventually rotting away in late fall. Pollination: Fruits are also formed without pollination. Fruit: The fruit is a small to medium, syncarp (leafy-topped, compound pineapple fruit), formed by the fusion of the ripe ovaries with the base of the sepals and the bracts and with the bark of the floral axis. The skin is tough and waxy, brownish pink to scarlet in colour. The flesh is pink-yellow in colour. The ripe fruit is more or less palatable (depending on clones), but it is smaller (less than one kilo), usually full of seeds, fibrous, lacking in juice and less fleshy than commercial pineapples, but very attractive. Remarks: Several varieties with cream white, pink, red, or yellow striated leaves do exist. 1) Forest & Kim Starr “Ananas bracteatus(Redpineapple)”. Plants of Hawaii. <http://www.starrenvironmental.com>. Downloaded on 20 August 2014. 15) Kramer, Jack (1976). "Bromeliads The Colorful House Plants." Litton Educational Publishing, Inc. pp. 33; 100. 16) Padilla, Victoria (1973). "Bromeliads". New York: Crown Publishers. p. 32. Cultivation and Propagation: Ananas bracteatus is a valuable ornamental bromeliads due to the beauty of the foliage and of the inflorescence and the facility of cultivation. There is a solid green form, but the variegated one is much more popular due to its year-round foliage colour. Growing substrate: It requires a well-drained, aerated, porous and moisture-retentive substratum which is rich of organic substance (e.g. 2 parts peat moss to 1 part loam to 1 part sand or perlite). Use only acidic soil. Exposition: It will grow in any exposure from full sun to full shade. Growth is faster and the leaves are more rigid in full sun..
Watering: In summer it enjoys constant moderate waterings from rain or sprinkler, but allow the plant to dry in-between waterings, and reduced in winter. However it is quite drought-tolerant. In dry and hot climate, humidity can be increased with nebulisations utilizing water at room temperature and not calcareous. Requires complete and perfect drainage as root rot can be a problem if the soil is too moist. Ornamental uses: Specimen plant; mass planting; container plant; tropical foliage and colourful ﬂowers. Red Pineapple is grown in tropical gardens and is used as a security hedge because of its spiny leaves. In colder places it can be grown indoors as a houseplant in luminous and spacious locations, seen the dimensions of the plant, even if there is the tendency to select for this purpose varieties of smaller sizes. Some ornamental varieties, including variegated cultivars are very valuable landscape plants that require very little care and create exotic tropical look. Other uses: In the origin countries, from the leaves they get particularly resistant fibres for ropes and textures; the fruit, and even more the stem, contain bromelain, a protelytic enzyme which, purified, is utilized both in pharmacology, mainly as anti inflammatory and anti oedematose, and in the alimentary industry for clarifying the bier, in tinned meat, for tendering it, and in the pre-cooked cereals. Propagation: Remove and replant stout offshoots from the base of the parent plant. Starting from the offshots at least 3 years are needed for the blossoming. This plant also tufts quickly and easily reproduces in a vegetative way by means of the new plants which come out from the axillary gemmae placed between the leaves and on the stem under the fruit, and the “wisp” of leaves over the fruit.